Finally managed to get some time to update my blog today. Been busy running all over the place at work and at home. The kids will be starting school again in a couple of weeks. Me and the wife have been shopping for new school uniforms, shoes, text and work books for the kids. Anyway, just to follow up on my roller chain mishaps, I managed to buy a replacement roller chain on Nov 30th. It was actually harder than I thought looking for a single-speed chain. In the end, I settled for a BMX roller chain from a bike shop in Sungei Way in Petaling Jaya. The new BMX roller chain from Taiwan. After installing the new roller chain on my Echo 26", I tried riding round. The roller chain kept slipping off my DIY roller chain tensioner. It was very annoying and frustrating. 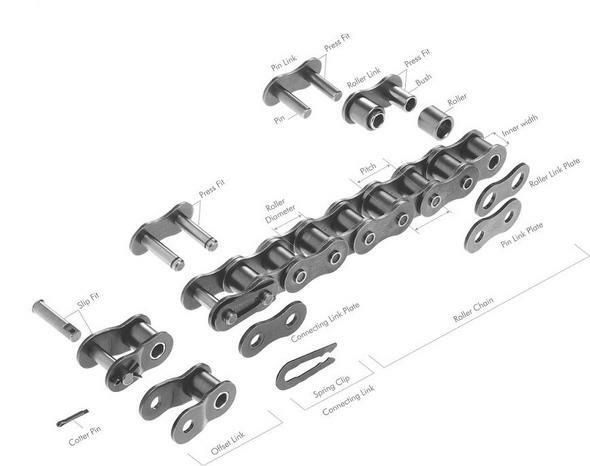 The new roller chain (right) compared to the old chain. I adjusted and re-aligned the tensioner to no avail. I continued riding, realigning and adjusting the tensioner a couple more times and decided to stop when I heard a "clink" sound, like something came off and dropped from the bike. I could not believe my eyes when I saw a piece of the roller chain link plate lying on the floor... LOL. "You have got to be kidding me," I thought. A photo showing the link plate that came off the pins when I pedal kicked. Apparently, the inner width between the link plates on the new roller chain were wider than the one that I had earlier, and that allowed one of the sprocket tooth to get caught in between the link plates, hence popping the link plate right off the roller chain! Scary!!! Right after that I packed up everything and decided to call it a night. My plan was to go get a new roller chain the next day... LOL. And this time I was going to bring my old original roller chain with me for comparison.... LOL. The next day and a couple of days later, I was just too busy with work to go looking for a new roller chain. It was only after a week later, on a Saturday (Dec 12th) that I decided to go to Kota Kemuning to look for Ah Chun of Tat Seng Bicycle Centre. I had decided to bring along my Monty 221PR to replace all the rear wheel spokes as well. In my mind, I had thought that if anyone could help me with my bike problems, it would be Ah Chun... LOL. And sure enough, he recommended a set of roller chain that were suitable for BMX, Trials or Freestyle bikes! That night, after I installed the new roller chain, everything came together perfectly! The chain was no longer coming off the tensioner sprocket and I could ride with confidence... but only after I had my eldest son, Joel, keeping an eye on the chain as I rode. I tried everything from hopping, pivoting, pedal kicking, etc. It worked great! Hahahaha. Confidence! Happiness! Side view of the 3 roller chains, with the newest one at the bottom. Top view of the 3 roller chains, with the newest one at the bottom. Notice the design? The bottom one is designed to be slip-proof! The new roller chain installed on my Echo. Closeup of the new roller chain on my Echo. And now I have both bikes in good working conditions. From here on, I am back on training and riding... whoohu!